Whether you want to warm your toes in front of a blazing fire on a winters day, or enjoy ice cold white wine whilst sat enjoying the summer sunshine in our garden – the Ram Inn will not disappoint. Offering a great home cooked food menu, with gluten-free and vegetarian catered for, plus a comprehensive wine selection and real ales. Both the pub and the restaurant provide comfortable, spacious and clean surroundings in which to relax. Ideally located in Old Bussage, Gloucestershire, we enjoy fabulous views over the Toadsmoor Valley and enjoy a truly tranquil cotswold setting. It is ideally situated for cotswold walks, as a start point or more often a well earned pit stop. Well behaved dogs are welcome in the bar area. Free wireless internet access is available throughout the pub. 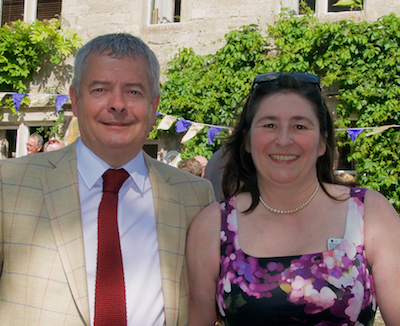 Both John and Melissa are members of the British Institute of Innkeepers. See our recommendations on TripAdvisor to see what customers are saying about us. John and Melissa Thwaite come from a long line of publicans – Melissa’s parents and grandparents were all in the trade, and the Ram is very much a family run business. Having held the Licence at the Ram over 20 years, they know just about everyone and everything locally. The premises where originally a farm which had a Cider Room and Sweet Counter as add on businesses. It was converted to a proper pub in 1811 and has been evolving ever since. Originally a Whitbread pub it is now part of the Enterprise Inns family. 16 years ago it was extended to provide further dining facilities. All of our food is home cooked and has an excellent reputation for quality and value. We cater for vegetarians and gluten-free preferences. As well as our standard menu we also offer Specials which change on a daily basis, a sample menu is below. Our main meals range from £9.50 to £17.95, while at lunchtime sandwiches are available from £2.75. It is always worth asking if your favourites are not on the specials board, Mel can often accomodate. All main courses served with a choice of salad or vegetables and a choice of chips, jacket or baby potatoes. We are situated in the old part of Bussage near Eastcombe off the A419 between Stroud & Cirencester. Right at the top of Toadsmoor Hill then immediately right again into Bussage.